We understand. The desire to achieve pregnancy and start a family is powerful. The yearning to have life growing in you becomes even more intense when you struggle with infertility. Each failed attempt at pregnancy is heartbreaking and increases your desperation to become a mother. Elizabeth Rohm (an actress from American Hustle, Heroes, The Client List and Law & Order) understands too from experiencing the infertility rollercoaster first hand. She wrote about her experiences in the book “Baby Steps: Having the Child I Always Wanted (Just Not as I Expected). Due to prematurely old eggs, Rohm was unable to conceive naturally. In her book she expresses where her mind was after discovering her infertility issues. Faced with a difficult decision of what to do, Rohm turned to Assisted Reproductive Technology (ART) as her next step on the road to achieving pregnancy. After a $20,000 IVF cycle, her dream came true. “The morning the nurse called to give me the results of the blood test after the embryo transfer, I was sitting in a white chaise longue on the bottom floor of our home, thinking, daydreaming, wondering, trying to be calm. I was in a sort of a dark reverie, imagining a future without a baby, or the long road that might lead to one if this try didn’t work. Having an actual baby, evening being pregnant, felt remote and impossible, a fading glimmer. I wonder how many babies. My palm moved over my belly in gentle circles, my first maternal act. I knew that they had implanted four. Four successful embryos had developed from the eight eggs they had extracted. How many babies? I would find out soon enough. I let the quiet and the knowledge sink slowly in, filling me with a calm sense of wonderment. Pregnant. Pregnant. Then I thought of Ron. He had to be next to know, of course. He had hoped and longed and despaired right along with me, and I know we had done it at last. As he had said, “The method doesn’t matter.” We had done it. We had made a baby. Should I wait until he got home from work? Should I throw him a party? Where was the ticker-tape parade? I felt like there should be at least confetti, raining down from the rafters. The house seemed immensely quiet in the face of this grand news. I felt the sudden need to speak. I couldn’t wait. It couldn’t wait another minute. He picked up on the third ring. Eight months later (after a premature delivery due to amniotic fluid leaking), Rohm gave birth to her daughter Easton, fulfilling her dream of motherhood. The Snowflakes Embryo Adoption Program understands the longing women, like Rohm, face when struggling to achieve pregnancy. We believe embryo adoption is a viable solution that many couples have never heard about, a solution that has brought about the success birth of over 370 babies! Through embryo adoption thousands of women have reached their dreams of pregnancy and starting a family. It’s possible for you to have the same exhilaration Rohm wrote about when she found out she was pregnant. Embryo adoption is also financially appealing, costing an average of $14,000. Embryo adoption allows families with remaining embryos to donate them to a family like yours. If you are considering purchasing human eggs or sperm, embryo adoption allows you and your spouse an equal genetic connection to the children you bear – none! To learn more about embryo adoption, how pregnancy is possible, and how it can be affordable for women facing infertility please visit Snowflakes.org. 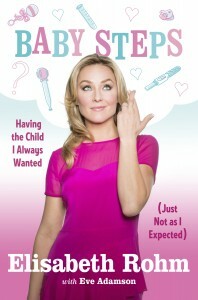 Excerpted from Baby Steps: Having the Child I Always Wanted (Just Not as I Expected) by Elisabeth Rohm. Available from Da Capo Lifelong Books, a member of The Perseus Books Group. Copyright © 2013.